Every day, our world seems to get more polarized. There are people on the news, at work, or even in our own families whose views seem so bizarre to us that we just can’t imagine what on earth they could be thinking. We want to change their minds. We just have no idea how to get through to them. Have we always been so far apart? Or is something dividing us? And if so, can it be stopped? Talking Across the Divide is my answer to these questions. In my 20 years speaking to both liberal and conservative groups, I’ve seen certain patterns repeat themselves again and again. I know what’s tearing us apart, and I’ve seen which strategies do or don’t work to get people on the other side of an issue to listen. If we’re honest with ourselves, many of us are sick of trying to talk to certain people. But if we don’t learn how to talk across our cultural divides, our society could very well fall apart. Talking Across the Divide offers practical strategies to overcome the five major barriers to communication and get through to the people you never thought you could reach. Maybe you could even change the world. The free Talking Across the Divide study guide is also now available. Download it here. 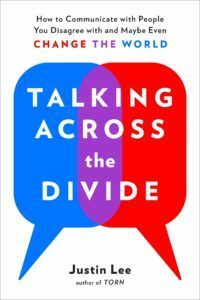 After reading the book, you can join the conversation by sharing your thoughts; I’ll post some of your comments in the coming weeks and months as we continue discussing how to heal our society’s polarization. I’ve got some videos coming soon, inspired by Talking Across the Divide. Stay tuned!